Sheri-Leigh is the co-founding director of NETpositive Futures Ltd and has been catalysing leading-edge sustainability activity in the tertiary education sector (and beyond) for over 15 years. She is an established expert in stimulating engagement with sustainability and especially experienced in developing networks and programmes that promote positive behaviours. Sheri-Leigh couples her practical, institutional experience with a history of strategic involvement that has helped shape the development of sustainability in the Further and Higher Education sector. This includes 7 years on the Board of the EAUC (4 years as Chair) during a period of intense growth for the organisation including a full strategic review and its establishment as a charity. As a member of national funding council steering groups she also contributed significantly to the development and delivery of the sector’s earliest sustainability strategies. More recently she has been part of the team developing the LiFE Index, facilitating the inputs from the sector to ensure a participatory approach and designing a whole institution methodology for embedding sustainability. 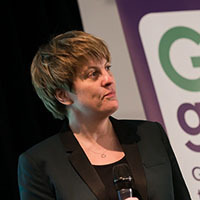 She has also worked with other sector organisations including the Higher Education Academy, Change Agents UK and NUS. The development of the NETpositive approach and associated tools has seen Sheri-Leigh working closely with teams from some of the UK’s leading Universities including Oxford, Cambridge, UCL, Nottingham Trent and Leeds. An ongoing role of strategic facilitation has also been a central part of delivering a two-year behaviour change programme for the University of Manchester. This relationship continues to grow and we have recently initiated an ambitious 4-year, whole institution staff engagement programme to contribute to the institution’s Social Responsibility aspirations. Sheri-Leigh also has considerable community engagement and development expertise; working directly or indirectly with organisations supporting social enterprise, community collaboration, events and activism. Believing firmly that social responsibility starts at a personal level Sheri-Leigh also uses her skills to support her our own community. Her voluntary roles as Director of the Community Interest Company, Sustainable Saltaire and as governor of her local college enables her to put this into practice.